Servo Instrument Corporation is a world leader in the design and manufacture of precision potentiometers. Servo is a small business, woman-owned company. 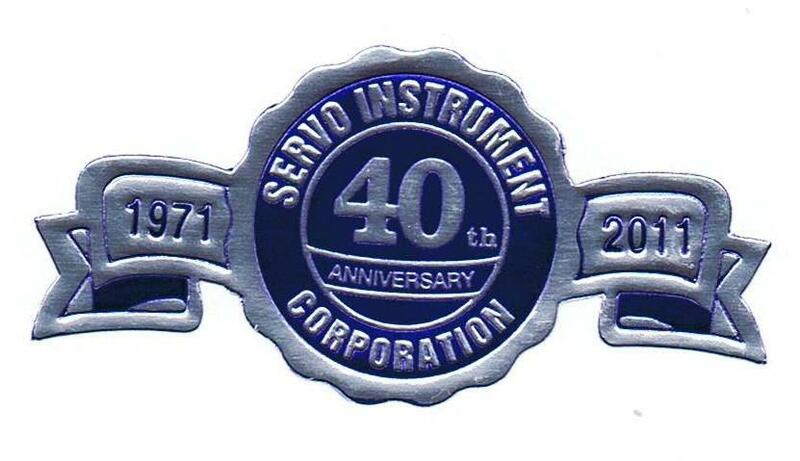 Servo Instrument Corp. was founded in 1971 by its' President Gordon R. Glorch, Sr. having 52 years in the manufacture of precision potentiometers and 4 years in the design applications of resistance wire. The Servo facility consists of 3 separate buildings which total 35,000 square feet. Our molding, winding and machine shop areas are in two buildings and our manufacturing, assembly and test areas are located in a separate building. This separation of areas leads to a much cleaner atmosphere for the manufacturing, assembly and test areas. Our potentiometers are designed to meet your requirements. Our capability includes conductive plastic co-molded technology and single turn wirewound potentiometers. Servo Instrument has a product line which is virtually unlimited in the scope of the type of units needed to satisfy your requirements. We manufacture a broad base of products which include rotary, linear (translatory) units, rheostats, potentiometeric assemblies consisting of motors, resolvers, clutch/brakes and switches. In addition, modular units consisting of any combination of resistance elements - either wirewound and/or conductive plastic, switches, detents and stops utilizing coaxial shafts for independent operation. Sector potentiometers can be supplied with terminals, lead wires or flex circuits. Matching elements and wiper assemblies are also available. We have met the extreme environments from deep space, missiles, ground vehicles, to the depths of the ocean floor. Servo Instrument is committed to excellence. During the years of our operation we have expanded our capability not only by experimentation and test but also by the acquisition of other manufacturers such as Kendick, Gamewell, Electro-Mec, portions of Dale, Amphenol/Fairchild and Litton-Potentiometer. In order to support many of the aged programs, Servo Instrument has maintained the capability to manufacture the potentiometers previously made by these companies. Where some of the manufacturers have "given up" the support of these old programs, we continue our support. Our military base comprises approximately 65-70% of our base and has established the quality of all our products in the Aerospace, Commercial, Industrial, General Aviation and Agriculture fields. Servo Instrument has many multi-year contracts with fixed unit prices and scheduled deliveries. This offers the customer attractive pricing and guaranteed on time deliveries. Our quality is of such high standard that several customers have given us "GOLD" ratings, "Dock-to-Stock" status and awarded "Certified Supplier" status. We welcome you to the family of customers who have relied on our quality-delivery-cost effective products and service. Servo's Molding Department has been upgraded to producing automated high quality co-molded conductive plastic elements in large quantities, resulting in 50 million life cycles in most designs. Servo's Machine Shop consists of an excess of 100 units consisting of CNC chuckers, CNC vertical milling centers and various other units of equipment to produce your potentiometers on time with the highest quality and at competitive prices.